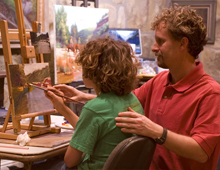 Mark Keathley's work shows a strong sense of family values. The viewer can almost feel himself being drawn back to a time when family was ALL important. Visit the world of Mark Keathley; take the time to slow down and stroll back in time. Back to an era when you could take the time to enjoy family and friends.